Dynn Leaupepe propelled the Cal Poly women’s basketball team to two more wins last week with 57 points between the two games, pushing the Mustangs’ win streak to four. With the wins, Cal Poly (13-8, 7-2) remains tied for second place in the Big West with UC Irvine (15-8, 7-2) and one game back of UC Davis (18-4, 8-1). The Cal Poly women’s basketball team took down the University of Hawai’i 52-50 Thursday night in Mott Athletics Center. The Wahine started off slowly but started to hit their stride late in the first quarter on a go-ahead three-pointer from sophomore guard Julissa Tago which put the Wahine up 16-13. The Mustangs managed to pull ahead 22-20 going into the half on a nearly solo effort from senior guard Dynn, who scored 14 of the Mustangs’ points in the first half, six of which came in the last four minutes of play. The Mustangs’ offense heated up in the third quarter, pushing their lead to 32-27 after a layup from Dynn. However, they were not able to hold on to the lead as the Wahine pulled ahead 37-35 after big offensive contributions from senior guard Sarah Toeaina and Tago. The Mustangs struggled to find their rhythm again in the fourth quarter, but Leaupepe brought the Mustangs within two with a layup followed by two back-to-back jump shots to put the Mustangs ahead. The Wahine answered right back with a go-ahead jumper from sophomore forward McKenna Woodfolk. In the final minute of the game, senior guard Lynn Leaupepe was fouled on a game-tying layup and sunk the and-one to put the Mustangs up by one. Senior guard Kelly Wong put the Mustangs ahead by two when she made one of her two free throws as the Mustangs held on for a 52-50 victory. Dynn netted 26 points and added six steals while Lynn tallied nine points and 10 rebounds. Cal Poly defeated UC Riverside 91-73 Saturday at Mott Athletics Center. Dynn led the Mustangs with 31 points, her fifth game of the season with 30 or more points. She has also scored 20 or more points in nine of her last 10 games. 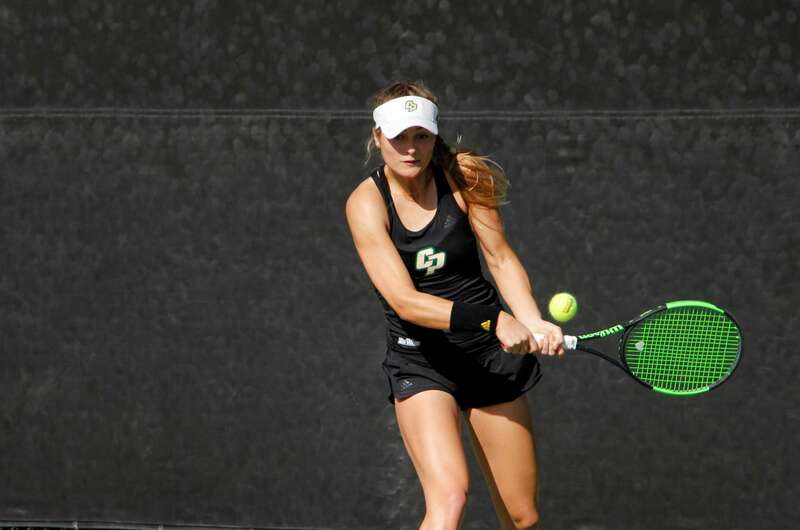 Cal Poly (13-8) has now won six of their last seven games while UC Riverside (6-17) fell to 3-6 in Big West play and remains in sixth place in the standings. The 91 points scored by the Mustangs was a season-high as well as a season-high 50 points scored in the second half. UC Riverside started out strong to begin the game, using an 11-3 run to go up 16-7 before the Mustangs took their first time out. Out of the timeout, Cal Poly responded with a 6-0 run sparked by back-to-back buckets by Dynn to cut UC Riverside’s lead to five by the end of the first quarter. The Mustangs’ offense caught fire with a 16-2 run to take a 40-30 lead with three minutes left in the second quarter after freshman Ayzhiana Basallo made two consecutive baskets to spark the run. Basallo tied a personal career high with three successful three-pointers. With six minutes in the third quarter, Dynn knocked down a jumper to move her to number four on the all-time scoring list for Cal Poly. Riverside went on another run, capped off with Marina Ewodo’s steal and layup to take the lead back 50-49, but the Mustangs responded with a three-pointer by Basallo kick-started an 11-2 run by Cal Poly to take a 63-52. The momentum continued as Cal Poly controlled the fourth quarter by going on a 13-5 run, breaking open the game and giving the Mustangs an 80-59 lead. The Mustangs forced the Highlanders into 24 turnovers which led to Cal Poly scoring 27 points off of turnovers. Cal Poly outscored UC Riverside 50-35 in the second half to cruise to victory. Next, Cal Poly will take on Big West-leading UC Davis on the road Wednesday, Feb. 7 with tip off at 7 p.m.